A time-line of production information for the 2010 series including the production blocks, pertinent facts and the general outline of the sequence of events leading up to the broadcast of series 5. Steven Moffat finishes writing The Eleventh Hour. 6th October - The new logo is unveiled to the public. Steven Moffat makes contact with Chris Chibnall regarding writing a story which would eventually become the Silurian two-parter. Steven Moffat has finished writing Time of Angels and Flesh and Stone by this point. 25th December - Having seen his neighbour David Morrisey in The Next Doctor, the writer Richard Curtis first started formulating ideas for a Doctor Who script. 15th July - The read-through takes place for The Time of Angels and Flesh and Stone. 20th July - Shooting started on Block 1, comprising episode 4 & 5: Time of Angels and Flesh and Stone. 21st July - Filming at Southerndow beach takes place, with Matt Smith and Karen Gillan record their first ever scenes together for Time of Angels. Paparazzi and fan pictures appeared all over the internet showing Alex Kingston and wreckage confirming the story features the crash of the Byzantium. 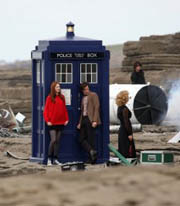 23rd July - Filming in Fonmon Quarry took place for scenes at the cliff face in Time of Angels. 27th July - Filming moves to Puzzlewood for scenes inside the Byzantium 'Oxygen Factory' for Flesh and Stone. This also includes the scene of the Doctor telling Amy to remember something, which would be inserted into the season finale. 5th August - Filming at Clearwell caves for Time of Angels. Block 2 consists of episodes 2 and 3: The Beast Below and Victory of the Daleks. 20th August - The read-through takes place for The Beast Below. 21st August - Filming takes place at Joint Resilience Building, Swansea for the World War II bunker in Victory of the Daleks. 27th August - Filming for Victory of the Daleks took to the roof of Cardiff University to record the scene of the Dalek being revealed to the Doctor. 28th August - In Jacob's Antiques Centre, Cardiff scenes were recorded including the Dalek offering tea. 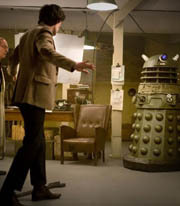 31st August - Scenes were recorded in the Brackla Bunkers for the War Rooms corridors of Victory of the Daleks. On this day the scene was also recorded for The Pandorica Opens in which Bracewell and Churchill discuss Vincent van Gogh's painting of the exploding TARDIS. 9th September - Filming takes place at Neath Abbey in Swansea for the final Tower scenes in The Beast Below. 11th September - Mamhilad Park Industrial Estate's Dupont Factory is dressed as the inside of Starship UK. Filming resumed on the 14th until 18th. 22nd September - A full-sized replica Spitfire is brought to Upper Boat for Victory of the Daleks. 22nd September - A night shoot takes place in The Orangery at Margam Country Park where the building formed the interior of Buckingham Palace for The Beast Below. Block 3 features a single episode - The season opener, The Eleventh Hour. 28th September - A rooftop at Mamhilad Park Industrial Estate doubles for the roof of the hospital for scenes in which the Doctor confronts the Atraxi. 29th September - Filming takes place at The White House in Cathedral Green, Llandaff for scenes inside the house belonging to Annette Crosby's character in The Eleventh Hour. 29th September - Mike Skinner records his cameo as a hallucinating security guard in Bute Park, Cardiff, for the opening scene of Time of Angels. 30th September - Brecon Cathedral is the setting for scenes set inside the Museum at the beginning of Time of Angels. 1st October - The Vicarage at Rhymney in Gwent is used for filming of Amy Pond's house in The Eleventh Hour. 6th October - Filming continues at Llandaff, with the village doubling for Amy's home of Leadworth, however the persistent rain causes shooting to be halted. 7th October - With better weather, recording resumes for The Eleventh Hour. Matt Smith wears a tattered version of David Tennant's suit and Karen Gillan is dressed as a policewoman. The internet floods with pictures and even YouTube footage of these scenes. Block 4 consisted of the Silurian two-parter: episode 8 & 9 entitled The Hungry Earth and Cold Blood. During late October and into the following month these episodes were shot at Upper Boat and Llanwonno, Wales. 20th October - Four days of filming for The Hungry Earth begins at the Church of St. Gwynno's Church, Llanwonno. 26th October - Bedwellty Pits in Tredegar is the setting for the scenes in the drilling project's pit housing, continued at Tower Colliery, Hirwaun. 9th November - Four days of filming starts at the Temple of Peace, a location used since the very start of the new series, but this time representing the Silurian city in Cold Blood. 13th November - Filming took place at Plantasia in Swansea for the Silurians' underground city. Block 5 featured filming abroad for episodes 6 and 10 in Croatia. This was because both The Vampires of Venice and Vincent and the Doctor took place on the continent, so non-English architecture was required. 23rd November - The read-through for The Vampires of Venice takes place along with Vincent and the Doctor. 24th November - Recording takes place at Llandaff Cathedral to feature as the chruch at Auvers in Vincent and the Doctor. 27th November - The National Museum of Wales takes the place of The Musée d'Orsay, where the Doctor shows Amy the paintings of Vincent. 30th November - The first filming takes place in Trogir, Croatia, for The Vampires of Venice, for the arrival of the TARDIS in Venice. 1st December - Scenes are recorded in Trogir for The Vampires of Venice, including the chase through the streets and Rory's sword-fight. 1st December - Steven Moffat completes his scripts for The Pandorica Opens and The Big Bang earlier than expected as production on the finale has been brought forward due to cast availability and heavy post-production requirements. 5th January - Neath Abbey is the setting for the crypt in which Vincent and the Doctor fight the invisible monster. 6th January - Roald Dahl Plass is used as the landing place for the TARDIS, supposedly outside The Musée d'Orsay where Amy and the Doctor take Vincet van Gogh. 7th January - Filming took place at Llancaiach Fawr Manor for scenes in Isabella's father's kitchen in The Vampires of Venice. 9th January - Caerphilly castle was used for scenes in which the female Vampires chased after the main characters. Block 6 is for episodes 12 & 13: The finale episodes of The Panorica Opens and The Big Bang. 13th January - The read-through for The Pandorica Opens is delayed when heavy snow prevents many people from arriving on time. 25th January - At the nightclub Crystal in Cardiff, the scene is recorded for The Pandorica Opens in which River Song picks up some essential equipment. 25th January - The National Museum of Wales is called upon to feature as the Museum. 26th January - Miskin Manor is the location for Amy and Rory's wedding reception in The Big Bang. 27th January - The crew returns once more to the Vicarage in Rhymney, Gwent to record the scenes of River Song in Amy Pond's house. 2nd Feb - The crew is priviledged to record scenes at Stone Henge in Wiltshire. 4th February - The final tone meeting for the the forthcoming block 7 takes place. 4th February - Margam Country Park is used as the location for the TARDIS landing and overlooking the Roman Camp. 17th February - The final day of filming at Upper Boat, including close-ups for the death of Amy and The Pandorica chamber from The Pandorica Opens, plus museum scenes for The Big Bang. The Pandorica set was the largest set ever built in the history of Doctor Who. The final Block is number 7, featuring episodes 7 and 11: Amy's Choice and The Lodger. 17th February - The read-through for the final block starts at around 4pm, running through both Amy's Choice and The Lodger. 24th February - Skenfrith, Monmouthshire is the location for Upper Leadworth including the castle ruins. 1st March - A house off St Athan Road is used as Amy and Rory's home in Amy's Choice. 4th March - The location of Westville Road in Cardiff is used as the exterior for the house in The Lodger, and the scene is recorded for The Big Bang in which Doctor sees Amy. 5th March - Matt Smith records his scenes playing football with James Corden for The Lodger, in Victoria Park, Cardiff. 6th March - Scenes are recorded inside the old people's home for Amy's Choice, with the location being Laneley Hall, Pontyclun. 20th March - Production wraps. 28th March - The Doctor Who team flies to Belfast to promote the new series. 30th March - The 'Wengerbus' arrives in Salford before going on to Northampton, having been travelling the length and breadth of the country for the last few days. 3rd April - The first episode, The Eleventh Hour, is broadcast. 12th April - Matt Smith, Karen Gillan and Stephen Moffat fly to America to publicise the new series in New York. Thanks mainly to DWM, and snippets taken from articles by Benjamin Cook and Jason Arnopp. Dates and further information taken from BBC.co.uk. Additional facts thanks to www.doctorwholocations.net. And a few snippets from Gallifrey Base.